Home based interventions are advocated in rural areas against a variety of diseases. The combination of different interventions might have synergistic effects in terms of health improvement and cost effectiveness. However, it is crucial to ensure cultural acceptance. The aim of the study was to develop an effective and culturally accepted home-based intervention package to reduce diarrhoea and lower respiratory illnesses in children. 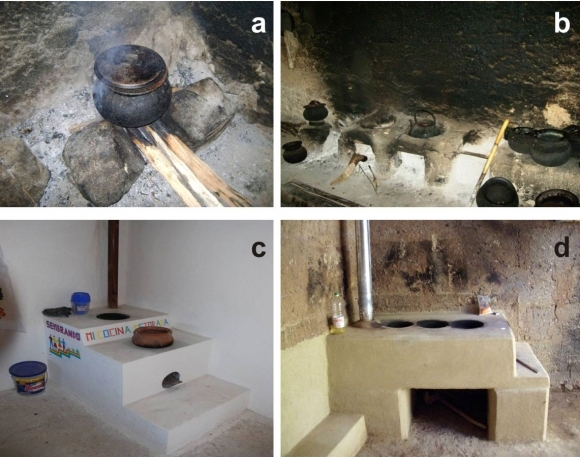 In two rural Peruvian communities we evaluated the performance and acceptance of cooking devices, household water treatments (HWT) and home- hygiene interventions, with qualitative and quantitative methods. New ventilated stove designs reduced wood consumption by 16%. The majority of participants selected solar water disinfection as HWT in a blind tasting. In-depth interviews on hygiene improvement further revealed a high demand for kitchen sinks. After one year of installation the improved chimney stoves and kitchen sinks were all in use. The intervention package was successfully adapted to local customs, kitchen-, home- and hygiene management. High user satisfaction was primarily driven by convenience gains due to the technical improvements and only secondarily by perceived health benefits. Les interventions à domicile sont recommandées dans les zones rurales pour éviter diverses maladies. L’association de différentes interventions entraîne une synergie en termes d’amélioration de la santé et de rapport coût-efficacité. Il est cependant crucial d’obtenir l’adhésion de la population. Le but de l’étude était d'élaborer un programme d’interventions à domicile, efficaces et acceptées par la population, visant à réduire la diarrhée et les affections des voies respiratoires basses chez l’enfant. Nous avons évalué, dans deux communautés rurales du Pérou, l’efficacité et l’acceptation d’appareils de cuisson, des traitements de l’eau domestique (HWT) et d’interventions d’hygiène à domicile à l’aide de méthodes qualitatives et quantitatives. De nouvelles cuisinières avec ventilation ont permis de réduire la consommation de bois de 16 %. La majorité des participants ont choisi la désinfection solaire de l’eau comme moyen de HWT lors d’un essai à l’aveugle. Des entretiens approfondis sur l’amélioration de l’hygiène ont en outre révélé une forte demande d’éviers. Un an après leur installation, les nouvelles cuisinières et les éviers sont tous utilisés. Le programme d’interventions a été adapté avec succès aux coutumes locales, à la gestion de la cuisine, du foyer et de l’hygiène. Le haut degré de satisfaction des utilisateurs résulte en premier lieu des bénéfices obtenus en termes de commodité dus aux améliorations techniques, et, en second lieu, des bénéfices obtenus en termes de santé. Las intervenciones en los hogares en áreas rurales se recomiendan para luchar contra una variedad de enfermedades. Combinar distintas intervenciones puede tener efectos de sinergia en cuanto a mejorar la salud y la rentabilidad. Sin embargo, es indispensable lograr la aceptación cultural. El objeto de este estudio fue desarrollar un paquete de intervención en el hogar eficaz y culturalmente aceptado para reducir la diarrea y las enfermedades de las vías respiratorias inferiores en niños. En dos comunidades rurales en Perú, se evaluó el rendimiento y la aceptación de dispositivos de cocina, tratamientos de agua doméstica (HWT) e intervenciones de higiene del hogar, con métodos cualitativos y cuantitativos. El nuevo diseño de las cocinas reduce el consumo de madera en un 16 %. La mayoría de los participantes eligió la desinfección solar del agua como método de HWT en una cata ciega. Las entrevistas detalladas acerca de las mejoras de la higiene también revelaron una alta demanda de fregaderos. Un año después de ser instaladas, las cocinas mejoradas y los fregaderos estaban todos en uso. El paquete de intervención fue adaptado con éxito a las costumbres locales y de gestión de la cocina, el hogar y la higiene. La elevada satisfacción de los usuarios fue principalmente el resultado de la mayor conveniencia que trajeron las mejoras técnicas y sólo secundariamente debida a las ventajas de salud observadas. 1Globally, more than 2.5 million children under five years of age die annually from diarrhoea and acute lower respiratory-tract infections (Black, et al., 2010). In Peru, recent national mortality statistics indicate 14% of deaths in children <5 years of age were attributable to acute lower respiratory-tract infections and 12% to diarrhoeal diseases (INIE, 2007, WHO, 2008). 2Several studies demonstrated that simple, efficient and effective interventions at household level including improved sanitation, personal hygiene and improved water supply are cost-beneficial and cost-effective approaches in reducing the diarrhoeal disease burden (Mäusezahl et al., 2009, Clasen et al,. 2007, Clasen et al., 2008, Ejemont et al., 2008, Hunter et al., 2008). A recent systematic review estimated that hand washing with soap reduced diarrhoea by 43% and household water treatment by 17% (Cairncross et al., 2010). This is especially important for populations with access to sufficient quantities of water of inadequate microbiological quality (Esrey et al., 1985). A further type of intervention that can reduce the burden of childhood disease is the provision of improved chimney stoves. A recent meta-analysis on the impact of household air pollution demonstrated a nearly two fold increase in the odds of suffering from childhood pneumonia if the child was exposed to smoke from incomplete combustion of household fuels (Dherani et al., 2008). Changing from open fires to improved ventilated stoves has been demonstrated to improve indoor air quality and reduce severe acute lower respiratory infections among infants (Smith et al., 2011). 3We carried out a study in Peru to provide a basis for designing a “package” of several interventions to tackle both, the problem of childhood diarrhoea and respiratory infections in a rural area in Peru. This was a pilot study for a planned larger programme of interventions carried out in a randomised controlled trial (Hartinger et al., 2011). Though single interventions can bring benefits, a package can bring greater advantages because of synergistic effects. An integrated package of home-based health interventions on priority child diseases will enhance health gains through synergistic effects. Synergy effects can be expected because children infected with one infectious disease become more susceptible to other diseases and multiple interventions are able to interrupt multiple transmission cycles at the same time. Furthermore, interventions addressing several health hazards simultaneously are more likely to address the caretakers’ perceived benefits leading to more sustainable compliance. Finally, the associated costs, especially management costs, are lower if multiple interventions are being implemented jointly. However, interventions can only bring real benefit if they are sustainable. This will only be the case if the interventions are culturally acceptable to the beneficiaries, and they need to be involved in planning and implementation. 4We describe the approach and the initial testing of an effective low-cost, home-based intervention package (IHIP) which would reduce the household burden of disease (acute lower respiratory infections (ALRI) and diarrhoea in children) in rural communities in the Cajamarca region of Peru. 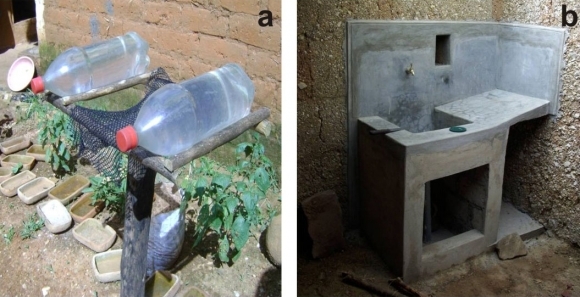 The package included the development and evaluation of an improved ventilated cooking stove together with a kitchen sink, the promotion of a home-based drinking water treatment technique combined with hand washing and hygiene education. Potential beneficiaries were consulted about their needs and preferences before the project started, and asked about their perceptions of the project after a year of implementation. The findings of the randomised controlled trial are published in subsequent papers. (Trial registry ISRCTN: 28191222). 5The study was carried out in seven communities in San Marcos Province, Cajamarca Region in the northern Andes of Peru from May to September 2008. 6The majority of the population relies on traditional open fire stoves inside the house called Tulpias for cooking (Figure 1). Wood for cooking is gathered or bought for an equivalent of US$ 2.5 per 20kg. The firewood usually lasts for three to four days with daily use for about six hours in a typical family of five members. Water supply systems consist of natural spring- or stream water led into reservoirs and piped to each rural household court yard. These systems are managed by small water boards belonging to each community, consisting of community members selected every two years. The boards are responsible for organizing and maintaining the use of the water supply systems, including chlorination. They collect monthly payments from each household, equivalent to US$0.35 to cover expenses for repair materials. Boards also designate work brigades for draining, cleaning and repairing the reservoirs and pipes, especially during the rainy season. The reservoir water is restricted to household water use (drinking, washing); other uses such as irrigation are prohibited and misuse is fined. 7There were five steps to selected appropriate technologies for drinking water treatment, stove improvements to reduce household air pollution, and improvements in household hygiene that would be culturally acceptable; i) We consulted local authorities and community members twice about appropriate designs and options, ii) We selected households to install and test the new devices, iii) we assessed the needs and concerns of user families, the general population and other stakeholders one month after the interventions were set up (August 2009), iv) we validated our surveillance instruments and tested our hygiene messages, and, v) we evaluated current use, determinants of adoption, rejections or discontinuation of using the stoves, sinks and water treatment and recorded users and non-users’ experiences and general perceptions about the different home-hygiene improvements 12 months after the IHIP had been implemented. 8 A total of 115 households were purposively selected. In 46 of these households we collected water samples to test solar disinfection and chlorine residue; in 58 households we carried out our control cooking and kitchen performance tests and in an additional 11 households open interviews and 3 focus group discussions were conducted. We selected communities that were currently not receiving any governmental or non-governmental aid or services except for the national conditional cash transfer programme JUNTOS (JUNTOS, 2010) and the Ministry of Health routine health programmes. The households had to fulfilled the following criteria: i) use of firewood, charcoal or dung as heating material for cooking, and ii) have at least one child aged between six and 35 months living at home, and iii) the households had to have easy access and be close to the city of San Marcos. Informed consent was obtained from all households willing to participate. 9We carried out anthropological work; i) to assemble general knowledge regarding health (diarrhoea, pneumonia, nutrition, health seeking practices) and hygiene, ii) to determine the perceptions of the intervention package after one month of introduction in the pilot households, iii) for gathering general perception of the community’s main stakeholders of the San Marcos Province in order to obtain a better understanding of the local framework conditions for a potential scaling up activities, and iv) to assess after one year the experiences and perceptions of the improved chimney stoves, sinks, water treatment and hygiene messages in the pilot households. 10The analysis of the data was done according to the methods described in Dawson, Manderson and Tallo (Dawson et al., 1993)for focus groupdiscussion and standard content analysis of interview data by grouping themes after coding the transcripts and selecting appropriate quotes to illustrate findings. 11The selection of the intervention was done in a truly participatory manner over a month interactive phase, were the study personnel become trustworthy and equal partners with the community. Thus this approach enable us to gain insights into cultural beliefs and potential approaches, this the sole aim of ensuring adherence, compliance and sustainable use of the interventions beyond the life of the project. 12We modified an existing and culturally well-accepted stove type to improve its performance. We assessed the efficiency of three existing stove designs called Tulpia, Tradicional and SEMBRANDO stoves and two newly developed stove models the OPTIMA-I and OPTIMA-II which were built based on out consultations with the communities. In 58 households, we purposely selected 16 households to built OPTIMA-I (N=4), OPTIMA-II (N=8) and SEMRBANDO (N=4) stoves, to carry out control cooking tests (CCT). In the remaining 42 households our kitchen performance tests (KPT) were conducted. 13The Tulpia open fire stove consists of three stones placed in a triangle holding one pot at a time (Figure 1a). The design of the traditional stove (Tradicional) varies, but usually consists of two to three potholders built on two piles of mud bricks crossed by a metal rod acting as support for the pots (Figure 1b). Traditional stoves neither have a combustion chamber nor a smoke removal system. The third model, SEMBRANDO, was promoted in a national governmental programme. The SEMBRANDO stove consists of an L-shaped combustion chamber made from a refractory material with two potholes and a flue/chimney (Figure 1c). The fourth and fifth models (OPTIMA-I and -II) were newly designed by a local manufacturer and built from red burnt bricks, plastered with a mixture of mud, straw and donkey manure (Figure 1d). Both models had three pot holders, a closed combustion chamber, a metal chimney with a regulatory valve, a hood, and metal rods that provided structure for the stove. The two stoves differed only in the number of red burnt bricks used for additional support within the combustion chamber (OPTIMA-I: 50 bricks. OPTIMA-II: 100 bricks). The research costs of the OPTIMA-II stove were US $57, including materials and labour which took four hours to build. Commercial mass production could substantially lower purchasing costs in the future. The use of local building materials was an essential precondition for facilitating future large-scale self-dissemination, manufacturing and repair. 14Quantitative and qualitative measures were used to assess the stoves performance and the preferences of the local population in order to choose a model for the intervention package to be tested in the forthcoming community randomised evaluation trial. Figure 1: Type of stoves found in the Province of San Marcos and the OPTIMA-II improved chimney stove model. a: Open fire “Tulpia”; b: “Traditional” stove; c: government design “SEMBRANDO” stove; d: OPTIMA-II stove. 15We conducted stove performance tests using two standard protocols in the family homes: the controlled cooking test (CCT) and a kitchen performance test (KPT) (Bailis et al., 2007, VITA, 2004). We deviated from the CCT-standard protocol in repeating the test twice, instead of three times. In each household we applied the protocol to the existing stove and the newly constructed OPTIMA stove using the most common wood type Hualango (Duranta cajamarcensis Moldenke) (Hartinger et al., submitted). Data was gathered once for a 24-hour period for the KPT. 16Testing tools and hardware included local mud pots, timers, two spring scales with a 20kg range (precision +/- 0.1kg) to measure remaining unburned wood, charcoal and ashes. 17Outcome measures for the CCT included a food-to-fuel ratio calculated as the ratio of fuel used by the amount of food for a standard cooked meal. Our standard meal consisted of 500g of unpeeled potatoes, 500g of rice and 1L of water. In order to simulate a normal cooking process, we placed pots with water in the other potholes. 18Outcome measures of the KPT were daily fuel use (measured as the total amount of fuel used in 24 hours), daily energy use (multiplying by the calorific value), fuel use per capita (kg/person) and energy use per capita (MJ/person). These measures were normalized by the age-corrected number of people served at the meal. Person-meals were calculated as number of adult male (15 – 59 years) equivalents. Children under 14 years were weighted by a factor of 0.5, adult females and males over 59 years by factor 0.8. We used the “Shell Foundation HEH Project Kitchen Performance Test: Data and Calculation Form” (Bailis et al., 2007) to calculate the calorific value of wood (18 MJ/kg). 19Study funding unfortunately did not allow for to measuring indoor household air pollutant levels. Additional funding allowed us to assess carbon monoxide (CO) and particulate matter of less than 2.5 microns (PM2.5) only seven months into the main trial (Hartinger et al., submitted). 20We collected a total of 46 water samples. All samples were used to analyze solar disinfection; out of these, 26 samples were analyzed for free chlorine and turbidity. 21Initially, various options for household drinking water treatment that would complement boiling - method officially promoted by the Ministry of Health- were discussed (chlorination, solar water disinfection (SODIS) and ceramic filters). Twenty three family members completed a blind tasting of differently treated waters. SODIS had the highest acceptance. The SODIS method is a low-cost HWT; requiring water in polyethylene terephthalate bottles (PET) to be exposed to direct sunlight for at least six hours in order to accomplish purification (Berney et al., 2006, Sommer et al., 2997). To test the acceptability and usages of the method, we provided four 2L PET bottles (cost per bottle US$ 0.20) to 12 households. Mother/caretakers were trained in the general application of the method in daily practice according to standard procedures (www.sodis.ch, Figure 2a). Figure 2: Solar disinfection and study kitchen sinks. a: Solar disinfection of drinking water and kitchen cloths; b: Study-built kitchen sink. 22There is considerable literature on the efficacy of solar disinfection (Sommer et al., 1997), however we decided to analysed the purifying effects of UV-light on drinking water in our setting, which is characterized by an intensive UV radiation, high altitudes and mild to cold temperatures. Samples that were collected from household drinking water supplies were placed in 2L bottles exposed to direct sunlight, and tested for bacterial load after 0, 2, 4, 6, 8, 24, 48 and 72 hours. Control samples were collected from the same drinking water source, placed in 2L bottles and kept in the shade for the same time intervals. 23Water samples were analysed for thermotolerant (faecal) coliforms using a standard membrane filtration method in the Oxfam DelAgua® field kit for water testing. This generated countable colonies. Samples were analyzed for the occurrence of thermotolerant coliforms and coliformsfollowing standard procedures from the 2002 WHO guidelines for drinking water quality (WHO, 2008). Results were expressed as colony-forming units per 100ml of water (CFU/100ml). 24We also analyzed free chlorine residues and turbidity (Nephelometric Turbidity Units) in water samples applying standard testing provided in the DelAgua water test kit. These tests were done to evaluate whether the water quality, of different community drinking water sources (reservoirs), had chlorine residue, and, thus, determine if they have been chlorinated according to local water quality guidelines. 25During our preliminary studies we found a high contamination rate of total and faecal coliforms on mothers’ and children’s hands (Gil et al., submitted). Our aim was to reinforce official health promotion messages regarding hand-washing, by providing a continuous and abundant flow of water in the kitchen area to lower barriers for hand washing at home. We installed kitchen sinks with pipes connected to the outside tap at US $68 (research costs) (Figure 2b). The price included materials (cement, bricks, tubing) and labour. Field workers encouraged participants to practice hand-washing according to the following procedure: wet both hands, lather them completely with soap or detergent, rub them for at least 45 seconds, rinse them with water and then dry. Mothers were instructed to wash their hands and children’s hands after defecation, after changing diapers, before food preparation, before eating and before feeding infants and small children - ideally with soap or detergent, which were universally available in local homes. 26The second hygiene message was to eliminate animal excreta from the kitchen environment and isolate household animals from the kitchen area. This was of particularly importance, because families in rural Andes areas maintain a close relationship with their domestic animals mainly guinea pigs, chickens and dogs, allowing them to roam freely within the house and the kitchen. Small children are particularly exposed to infection from animal excreta because they inevitably spend a lot of time in the kitchen with their mothers. Compliance was not formally assessed during our evaluation. 27Kitchen utensils and kitchen cloths are an additional potential source of contamination in the kitchens environment. In our study households, the kitchen cloths, called Mallas, wereidentified as the most contaminated utensil in the kitchen. 28This study was approved by the Nutrition Research Institute (IIN) Ethical Review Board and the Cantonal Ethical Review Board of Basel, Switzerland (EKBB). All participating families provided written informed consent. 29Several health topics were addressed during personal interviews and focus groups. Our aim was to understand the concerns and perceptions of the families with respect to respiratory infections, diarrhoea and nutrition and how the interventions were initially perceived also regarding potential benefits and obstacles for sustainable use. 30In general, mothers considered respiratory infections being caused by cold weather and changing seasons. To prevent children from getting sick, mothers thought that they should dress children in warmer clothes. “They usually get the flu from the cold and the change of the weather, from that they get the flu. Sometimes they get fever and a little bit of diarrhoea” (Chuquipuquio Community, mother, 39 years). A father from Manzanilla, also commented that “up until now my child has been sick of the flu, no other disease. The children in Manzanilla get the flu and diarrhoea. The flu occurs because of lack of cleanliness and cold weather. When the mother is sick, the child will get sick through the breast milk and that causes disease… for them not to get sick the mother has to wrap up the child and herself with lots of cloths (Manzanilla Community, father, 24 years). For some families it was evident that wood smoke caused health problems in children and in grown-ups, causing eye irritation, problems in the lungs and asthma: “the smoke affects the lung” (Chuquipuquio Community, mother 39 years). “The smoke irritates the child, the child goes in the kitchen and starts crying and they can’t breath. They can get a disease if they absorb the smoke” (Pomabamba Community, father, 20 years). In contrast, older women seemed to be accustomed to the exposure of smoke. They were also more concerned about collecting heavy loads of firewood, back pains from this activity, and the time spend for collecting wood, a resource they perceived as becoming increasingly scarce. 31In almost all in-depth interviews contact with dirty floors and children putting dirty hands in their mouths or eating with dirty hands were the three exclusively mentioned causes for child diarrhoeal illness. Respondents were not aware that other family members could also be a source for contaminating the child while cooking or handling. However, when asked about hygiene and hand washing, family members responded always washing their hands and also reported the appropriate times for it: “I wash my hands before I eat my food and after I go to the bathroom. We are in contact with the dirt, because we work in the fields.”(Chuquipuquio Community, mother, 39 years). “I wash my hands with water and soap. I wash my hands when I sit down for lunch and to go for a walk. My daughter does not wash her hands, her mother washes them for her with warm water, but without soap because her hands are clean, they don’t get dirty she can only sit down, she can not crawl” (Pomabamba Community, father, 20 years). 32Water was not considered on a causal pathway for acquiring child diarrhoea. Water was perceived as clean and many families drunk it directly from the outside water faucets. Only few said that they boiled water for drinking, but only for the child. As described earlier, natural water source were lead into reservoirs, and in theory they were chlorinated. However we could not find traces of free chlorine in any of the water samples taken directly from the faucets (Gil et al., submitted). We later learned that reservoirs were only cleaned once a month with chlorine. When we asked community members about the mandatory chlorination of their reservoirs all of them expressed that they disliking it due to the taste and fear of acquiring disease, such as cancer. 33Mothers did not mention nutrition as a health problem, either because of denial or because of not being able to recognize under-nourishment in children. A mother said “they [health staff] have told me that my daughter is undernourished, because she is now one year and a half and does not gain weight. I don’t think she is undernourished because we feed her and she eats fine. Why would she be undernourished? None of my other children ever were.” (Socchagon Community, mother, 35 years). “I have not seen an under nourished child. They are skinny and do not grow.” (Sicsibamba, Community, mother 32 years). 34Initial impressions from participating families were important to recognize potential problems. Families from one community partly misinterpreted instructions on how to apply the SODIS method: a mother exposed water bottles (and her potatoes) only during the night- because of the purifying effects of moonlight. 35Faster cooking and resulting time saving allowed mothers/caretakers to do a variety of other activities e.g. washing utensils, cleaning and tending their animals. This was recognized as one of the most important benefit of the improved chimney stoves: “There is less smoke in the kitchen environment, and my son is exposed to less smoke. We can cook faster and the food remains warm for a much longer time. (Manzanilla, Community father, 34 years) Additionally, the same father reported that he acquired the skills to build improved chimney stoves and would be ready to assist others when ever they build a new stove. Kitchen sinks, provided running water inside the household and were considered the most important benefit of the IHI package and at large. Repeatedly during those initial assessments participating mothers remarked that they were initially anxious to participate as they strongly feared that foreign organizations and mining companies (common in the area) come to the region to try and steal their children. Those experiences were essential for strategizing our approach in the project implementation. 36All improved chimney stoves and kitchen sinks were being used on a daily basis after one year. Sixty six percent of households claimed that the stoves were in excellent conditions and that no repairs were needed. However, three households mentioned that they had to repair their stoves twice since the installation. All kitchen sinks were in good condition and no negative remarks or disadvantages were recorded. The amenity of the sinks was highly valued, not only due to the increase availability of water but also for facilitating a much more time-efficient cleaning of the kitchen environment: “Before I had to carry the water from outside and did not use Ayudin [type of detergent] because I needed a lot of water, - now I wash everyday with Ayudin”(Manzanilla Community, mother, 32 years). 37Mothers confirmed initial impressions that a key advantage of the improved chimney stove installed in their kitchen was the additional time freed from supervising the cooking, -time they used for other household chores. Consistently they reported less eye irritation among their children and among themselves, better health in general and well-being and significantly less wood consumption “I cook faster using the three pot-holders at the same time. I start to cook at 9:00 to 10:00am and the food keeps warm until 12:00pm. I can knit while cooking” (Manzanilla Community, mother, 29 years). 38In contrast to the enthusiastic uptake of the indoor air and kitchen hygiene devices the SODIS HWT was adopted and continued to be used by 30% of the households after being instructed on how to apply the method only once on a single household visit at the beginning of the study. To apply a household water treatment method (boiling, chlorine) was not perceived as necessary; families believed that by cleaning the reservoir once a month with chlorine the water supply would remain clean. The rainy season was also considered an inappropriate time to use SODIS: “We don't have the bottles out, because it started to rain and the water turned green, rain, rain and rain, we did not change the bottles any more. During the summer yes … the bottles helped…we all drink from them…but we did not get used to them when there was no sun” (Manzanilla Community, mother, 35 years). 39Table 1 summarizes the CCT results. Data showed that both OPTIMA models had a significantly shorter cooking time compared to the open fires. Similarly, the OPTIMA stoves had a 15% lower ratio of food-to-fuel compared to the open fires; however, this difference was not statistically significant. The performance of the SEMBRANDO stove was always below that of the OPTIMA designs. a: Mann Whitney pair wise comparisons, open fires were used as reference group. * Time required to start the fire and cook the test meal in the main furnace. ** Grams of wood required to cook a Kg of typical noon meal for a family. 40Table 2 summarizes the KTP results. Overall the OPTIMA-II stove showed a better performance compared to the open fire stove, showing a 15% reduction in daily fuel and energy use and 16% reduction in fuel and energy use per capita. However, there was considerable variation and the improvements were not statistically significant. 41Despite the fact that the OPTIMA-I model exhibited a better performance in the food-to-fuel ratio, we selected the OPTIMA-II to be implemented as part of the intervention package, since additional bricks within the combustion chamber could provide a longer lifespan and sturdiness. Table 2: Results of the Kitchen Performance Test: Comparison of two stoves types under normal household conditions during 24 h in terms of total and per capita fuel used and energy consumption. 42To evaluate the perception regarding home-based water treatment techniques we carried out a blind tasting test, were 23 household members participated. We poured five glasses of differently treated drinking water (boiled, solar-disinfected, chlorinated, commercially bottled water and untreated tap water) in numbered glasses offered to the blindfolded participants. About half of the participants preferred the solar disinfected water and only 9% favoured the chlorinated water. 43To test the efficacy of SODIS, we collected a total of 46 water samples from different sources, 10 samples were initially uncontaminated and further two had contamination levels above the detection limit and, therefore, were not included for the analysis. From the remaining 34 samples, nine samples were used as controls and 25 samples were exposed to sunlight. Three of those 25 samples were exposed during cloudy conditions and were analyzed separately. 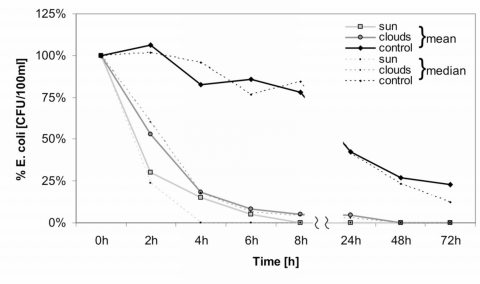 As seen in Figure 3, water bottles exposed to direct sunlight, reached on average zero thermotolerant coliform counts after eight hours. If the weather was cloudy the bottles reached zero thermotolerant coliform, counts after 48h of exposure, although the counts were already remarkably lower at 8h of exposure. The turbidity ranged between 5 to 30 NTU, only one sample had a turbidity of 50 NTU and was filtered before exposed to sunlight. Figure 3: Thermotolerent coliforms concentration in water samples after exposure to sunlight in normal sunny days. Sunny days (n = 22, light grey line); cloudy days (n = 3, dark grey line) and control bottles not exposed to sunlight (n = 9, black line). 44The aim of the study was to exploit in a participatory approach options for an integrated home-based environmental intervention package that would address local needs regarding kitchen hygiene and cooking preferences and result in well-perceived convenience gains that would not only lead to a higher compliance, but also to reduced households burden of disease in a forth coming evaluation trail. The locally made OPTIMA-II stove was selected as the best improved chimney stove model from several options. Families of two test communities chose the OPTIMA-II stove for scale-up in the subsequent community-randomised evaluation of a home-based environmental intervention package to improve indoor air quality, drinking water quality and home-hygiene. 45Selection criteria were based on a CCT, where the OPTIMA-II model had the shortest total cooking time, and smallest food-to-fuel ratio. The KPT revealedthat OPTIMA-II stoves used less daily fuel and energy than other locally available alternatives. Mothers’ overwhelming acceptance, sustained use and the general perception of a massive convenience gain, including substantial time saved were also important selection criteria. 46The installation of the kitchen sink facilitated hand washing with soap, and washing of utensils with detergent, generated a cleaner kitchen environment and fostered home hygiene in general. Since water was available all the time -with exceptions during the dry season- they were not restricted in using the kitchen sinks. We did not measure the increase in water utilization, but it is known that water availability is crucial and as important as water quality for hygiene improvements (Esrey et al., 1985 Fewtrell et al., 2005). We plan to evaluate the increase of water consumption in the forthcoming trial in order to distinguish also potential effects of increased water quantity on health (Fewtrell et al., 2005). Solar disinfection was selected as the HWT by the communities in a participatory manner. The other two options –chlorination and filtration- rendered unfeasible. Chlorination was universally rejected, based on bad flavour and a popular belief that chlorine could be dangerous for the health of children. We searched for ceramic filters as reliable HWT alternative for this population but could not find any local suppliers. Therefore, SODIS was chosen to be promoted as water purification technique in the intervention package. Some authors voiced concerns regarding potentially hazardous agents being released from PET bottles when exposed to sunlight (Shotyk et al., 2006, Sax, 2009). Recent respective evaluations, however, indicated no negative effects (Ubomba-Jaswa et al., 2010)and reported comparable levels of contaminants among commercially bottled water (Schmid et al., 2008). To address potential negative adherence, our SODIS education campaign will address this issues. Additionally, our study confirmed that water was disinfected after eight hours of solar exposure as indicated by zero thermotolerant coliform, growth. Thermotolerant coliforms counts remained high in control samples unexposed to sunlight. These, findings are in concordance with evaluations in similar mountainous high altitude settings (Boyle et al., 2008). However, the educational messages of the SODIS method had to be adapted to local beliefs; mothers thought that exposing water to direct sun could cause health problems, by bloating their stomach and, hence, they were reluctant to consume it at first. However, it should be noted that in this small scale pilot setting the SODIS HWT was not implemented with the intensity as indicated in the published guidelines (www.sodis.ch) or when going to scale (Mäusezahl et al., 2009).When mothers were told the bottles had to be exposed for one day, they agreed to consume the water, because this meant leaving the bottles exposed to the purifying effects of the moonlight i.e. now being fully compatible with local believes that moonlight has curative effects on humans and environment. 47A general misconception regarding chlorination of the reservoir was identified. Cleaning and maintenance with chlorine do not equate chlorination. No chlorine dispenser or any other chlorination method was found indicating neither current nor passed use. This is consistent with other observations of chlorination used in Latin America (Arnold & Colford, 2007, Rufener, et al., 2010). Similar results were found when testing the San Marcos and Cajamarca city water supplies. No trace of residual free chlorine was found, indicating a regional and not just a local problem. In the study area, peoples dislike for the taste and smell and fear of potential health problems were identified as barriers for the adoption of chlorination as a HWT. There is a need to develop a specific intervention to bring chlorination to its full use both; in cities in the Cajamarca Region as well as in rural water supply systems given that an ubiquitous piped water system is the ultimate aim of the national water supply programme. 48Our microbiological studies indicated that kitchen cloths were heavily contaminated21. Many studies in developed and developing countries identified kitchen sponges or dishcloths as a source of contamination of food and hands (Sharma et al., 2009, Hilton & Austin, 2000). Effective interventions like the use of disinfectants, hand washing or more sophisticated treatment options have been developed and globally promoted (WSSCC, 2010, Luby et al., 2004). We applied solar disinfection based on UV radiation, to disinfect successfully and at no cost the malla’s used in our study area as kitchen cloths. 49There are limitations to the study. The sample size used in this exploratory study was small. The selected families may hence not fully represent the population of the study area, although they lived in the same area and under conditions similar to the communities envisaged to participate in the forthcoming evaluation trail. In the selection of the improved chimney stove, we did not include any evaluation regarding the reduction of indoor air emissions, due to budget constraints. Air quality measurements were taken in a subsequent study. 50In conclusion, this study identified three promising, home-based interventions that could be implemented in concert as a package and at larger scale. We will evaluate in a community-based cluster randomised trial the efficacy of an integrated home-based intervention package (IHIP) in reducing child diarrhoea, ALRI and improving child growth combing an improved chimney stove, a kitchen sink with running water and solar drinking water disinfection and kitchen- and food hygiene education on child diarrhoea, acute respiratory illnesses and growth in 51 rural communities in Peru. 51The authors wish to express their appreciation and thank the study families for their kind participation and local authorities for their continuous support throughout the study. We would also like to express our gratitude to the field teams, especially to Mr. Roger Abanto who was instrumental in finding many of the local solutions to the stove programme and together with Mr. Concepcion Sanchez who designed the OPTIMA-improved stoves. We also appreciate the set up work of Michelle Lozada and unfailing support given of Ines Pineda in the microbiology lab. Black RE, Cousens S, Johnson HL, Lawn JE, Rudan I, Bassani DG, et al., (2010) “Global, regional, and national causes of child mortality in 2008: a systematic analysis”, Lancet. Vol.375, No 9730, pp. 1969-1987. Mäusezahl D, Christen A, Pacheco GD, Tellez FA, Iriarte M, Zapata ME, et al., (2009) “Solar drinking water disinfection (SODIS) to reduce childhood diarrhoea in rural Bolivia: a cluster-randomized, controlled trial”, PLoS Med. Vol. 6, No. 8, pp. e1000125. Clasen T, Schmidt W, Rabie T, Roberts I, Cairncross S., (2007) “Interventions to improve water quality for preventing diarrhoea: systematic review and meta-analysis”, BMJ, Vol. 334, No.7597, pp.782. Clasen TF, Thao DH, Boisson S, Shipin O. (2008) “Microbiological effectiveness and cost of boiling to disinfect drinking water in rural Vietnam”, Environ. Sci. Technol, Vol. 42 No. 12, pp. 4255-4260. Ejemot RI, Ehiri JE, Meremikwu MM, Critchley JA., (2008), “Hand washing for preventing diarrhea”, Cochrane Databaseof Systematic Reviews, No. 1, Art. No. :CD004265, DOI: 10.1002/14651858.CD004265.pub2. Hunter PR. (2010) “Household water treatment in developing countries: comparing different intervention types using meta-regression”, Environ. Sci. Technol, Vol. 43, No. 23. pp: 8991-8997. Cairncross S, Hunt C, Boisson S, Bostoen K, Curtis V, Fung ICH, et al. (2010) “Water, sanitation and hygiene for the prevention of diarrhea”, Int J Epidemiol, Vol. 39, No. Suppl 1, pp.i193-205. Esrey SA, Feachem RG, Hughes JM., (1985), “Interventions for the control of diarrhoeal diseases among young children: improving water supplies and excreta disposal facilities”, Bull. World Health Organ, Vol. 63, No. 4, pp. 757-772. Dherani M, Pope D, Mascarenhas M, Smith KR, Weber M, Bruce N., (2008) “Indoor air pollution from unprocessed solid fuel use and pneumonia risk in children aged under five years: a systematic review and meta-analysis”, Bull. World Health Organ, Vol. 86, No. 5, pp.390-398C. Smith, KR, McCracken JP, Weber MW, Hubbard A, Jenny A, Thompson LM, Balmes J, Diaz A, Arana B, Bruce N., (2011) “Effect of reduction in household air pollution on childhood pneumonia in Guatemala (RESPIRE): a randomized controlled trial”, Lancet, Vol. 378, No. 9804, pp.1717–26. Hartinger S.M, Lanata C.F., Hattendorf J, Gil A.I, Verastegui H, Ochoa T, and Mäusezahl D. (2011) “A community randomised controlled trial evaluating a home-based environmental intervention package of improved stoves, solar water disinfection and kitchen sinks in rural Peru: Rationale, trial design and baseline findings”, Contemp Clin Trials, Vol 32, No. 6, pp.864-873. Dawson S, Manderson L, Tallo VL., (1993) “A Manual for the Use of Focus Groups 1st ed”. International Nutrition Foundation for Developing Countries (INFDC), Boston, MA, USA pp. 96. Bailis R, Berrueta V, Chengappa C, Dutta K, Edwards R, Masera O, et al. (2007) “Performance testing for monitoring improved biomass stove interventions: experiences of the Household Energy and Health Project”, Energy for Sustainable Development, Vol.11, No 2, pp.57-70. Leon B. (2006) “Verbenaceae endémicas del Perú”, Revista Peruana de Biología, Vol. 13, No.2, pp.669-676. Hartinger SM, CommodoreAA, Hattendorf J, Lanata CF, Gil AI, VerasteguiH, Aguilar-Villalobos M, Mäusezahl D, Naeher LP. “Household air quality in rural Peru: effectiveness of an improved cooking stove to reduce exposure to incomplete biomass combustion”. Submitted. Berney M, Weilenmann H, Simonetti A, Egli T. (2006) “Efficacy of solar disinfection of Escherichia coli, Shigella flexneri, Salmonella Typhimurium and Vibrio cholerae”, J. Appl. Microbiol, Vol. 101, No. 4, pp.828-836. Sommer B, Marino A, Solarte Y, Salas ML, Dierolf C, Valiente C, et al. (1997) “SODIS: an emerging water treatment process”, J water SRT-Aqua, Vol. 46, No. 3, pp.127-137. WHO, (2008) Guidelines for Drinking-water quality: incorporating 1st and 2nd addenda, Vol.1 Recommendations, pp. 668. Gil A, Lanata CF, Hartinger S, Maeusezahl D, Padilla B, Ochoa TJ, et al. “Faecal contamination of food, water, hands and kitchen utensils at household level in rural areas of Peru”. Submitted. Fewtrell L, Kaufmann RB, Kay D, Enanoria W, Haller L, Colford JM. (2005) “Water, sanitation, and hygiene interventions to reduce diarrhoea in less developed countries: a systematic review and meta-analysis”, Lancet Infect Dis. Vol.5, No.1, pp.42-52. Shotyk W, Krachler M, Chen B. (2006) “Contamination of Canadian and European bottled waters with antimony from PET containers”, J Environ Monit, Vol.8, No.2, pp.288-292. Sax L. (2009) “Polyethylene Terephthalate May Yield Endocrine Disruptors”, Environ Health Perspect, Vol.118 No.4, pp.445-448. Ubomba-Jaswa E, Fernández-Ibáñez P, McGuigan KG. (2010) “A preliminary Ames fluctuation assay assessment of the genotoxicity of drinking water that has been solar disinfected in polyethylene terephthalate (PET) bottles”. J Water Health, Vol.8, No.4 pp712-719. Schmid P, Kohler M, Meierhofer R, Luzi S, Wegelin M. (2008) “Does the reuse of PET bottles during solar water disinfection pose a health risk due to the migration of plasticisers and other chemicals into the water?”, Water Res, Vol.42, No.20, pp.5054-5060. Boyle M, Sichel C, Fernández-Ibáñez P, Arias-Quiroz GB, Iriarte-Puña M, Mercado A, et al. (2008) “Bactericidal effect of solar water disinfection under real sunlight conditions”, Appl. Environ. Microbiol., Vol.74, No.10, pp.2997-3001. Arnold BF, Colford JM. (2007), “Treating water with chlorine at point-of-use to improve water quality and reduce child diarrhea in developing countries: a systematic review and meta-analysis”, Am. J. Trop. Med. Hyg, Vol.76, No.2, pp.354-364. Rufener S, Mäusezahl D, Mosler H, Weingartner R. (2010) “Quality of drinking-water at source and point-of-consumption--drinking cup as a high potential recontamination risk: a field study in Bolivia”, J Health Popul Nutr, Vol. 28, No.1, pp.34-41. Sharma M, Eastridge J, Mudd C. (2009), “Effective household disinfection methods of kitchen sponges”, Food Control, Vol.20, pp.310-313. Hilton AC, Austin E. (2000), “The kitchen dishcloth as a source of and vehicle for foodborne pathogens in a domestic setting”, International Journal of Environmental Health Research, Vol.10, No.3. pp.257. Luby SP, Agboatwalla M, Painter J, Altaf A, Billhimer WL, Hoekstra RM. (2004), “Effect of intensive handwashing promotion on childhood diarrhea in high-risk communities in Pakistan: a randomized controlled trial”, JAMA, Vol.291, No.21, pp.2547-2554.